Interestingly, patients with mild PD showed improvements earlier than patients with moderate to severe PD, particularly in the gait-related outcome measures. … These early differences may have been due to the ability of patients with mild PD to tolerate and complete more repetitions during the circuit training regimen. … However, patients with moderate to severe PD did eventually show improvements in most outcome measures, suggesting that they required a longer training duration to acquire the necessary training capacity. Another key observation of this case series was that all patients continued to make improvements in balance, gait, and quality of life… The majority of changes that achieved and surpassed the established MDC values were seen at the 36-week test, indicating that long-term training may be necessary to attain maximal gains. Patient 6 attended only 3 boxing sessions after the initial 12 weeks of the case series but maintained or improved scores on most outcome measures at the 24-week test, indicating a sustained benefit of the boxing training program. However, at the 36-week test, patient 6 showed a decline in scores on 5 outcome measures, perhaps because he was no longer attending boxing sessions. (He cited travel distance, conflict with work schedule, and lack of interest in boxing as the reasons.) 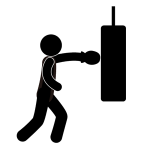 The 5 patients who continued to attend boxing sessions during the course of the case series showed persistent long-term benefits, lending support for their continued use of the boxing training program. I feel sorry for Patient 6…Exercise may be the best medicine, but it requires a lot more effort than taking a pill. In 2013, Professor Combs-Miller led a study comparing group boxing training to traditional group exercise on function and quality of life in persons with Parkinson disease (PD). The study period was limited to 12 weeks, which is interesting considering the first study showed that patients with moderate to severe PD required a longer training period. Results showed both groups improving with traditional exercise leading to better confidence in balance, and the boxing group showing more improvement in walking function (speed and endurance). An abstract of the study is available at http://www.ncbi.nlm.nih.gov/m/pubmed/23422464/. Combs-Miller has done numerous studies, and she says a paper documenting her findings is set to be published soon. But she can’t yet explain the correlation. She says it could be the boxing exercises, which are multimodal, simultaneously testing strength, endurance, balance and coordination. Or it could simply be the high-intensity interval training. Or maybe it’s something else, something more intangible. One thing that popped up during Combs-Miller’s research was the fact that more than any other patients, Rock Steady boxers showed up on a consistent basis. The full ESPN article is worth reading at http://espn.go.com/espnw/culture/feature/article/15416797/rock-steady-boxing-program-brings-empowerment-parkinson-patients. Hopefully, the study will be published soon. It is interesting that the study does not appear to explore why it works, although that is probably not as important as showing that it does work. The possible reasons that she suggests are very good theories. While we wait for the official study results, the anecdotal results are in…these Parkinson’s Boxing programs require a lot of effort from the participants, but at worst, they are delaying the progression of the disease…at best, participants are regaining lost strength and capabilities. i have PD, am 75 , a former dancer. i have also spinal stenosis in lower back and cervical but neither painful. i have osteoporosis, weak bones. can i still do boxing? The boxing part is non-contact, and basically involves you punching and possibly kicking a heavy bag. It’s not a competition, so you’re not going to be judged on how hard you hit the bag. With the Rock Steady Boxing program, your first step is usually an evaluation with an instructor/trainer, so they can better understand your physical condition and any concerns that you might have. Most of the exercises are adaptive, in the sense that participants have different capabilities due to level of fitness, but also because participants have pre-existing injuries, surgeries or conditions that need to be taken into consideration. With PD exercise programs, extra emphasis is placed on avoiding injury. You want to avoid activity that has potential to make an injury worse. Injuries cause further restriction of your movement, and the less you move, the more PD seems to intensify its hold on you. Of course, one of the main goals of exercise is to strengthen you to help avoid injuries outside of class, especially falls. As a former dancer, you might also want to explore if there are any dance classes in your area for seniors. I know there are a few PD specific dance programs, but those are not as common as boxing.